Custom build is basically where you are in control of the design of your house but don’t have to worry about the planning. There are certain areas where a housing site is designed with infrastructure being put in by the developer. You buy one of the plots, which has planning permission and all the services and you are responsible for the design of your own home. As opposed to most new developments where you have to put up with what the developer gives you. You can go the whole way and actually build the house yourself. Or you can get someone else to build it for you. But what is built is up to you (although it will have to comply with planning and building regulations). Often houses are manufactured off-site and then set up on site as discussed in my modular housing article. I learned about all this initially from the Guardian Article on Graven Hill which is the largest custom built plot ever. It’s in Oxfordshire and will consist of some 1,900 homes – all with designs agreed with their owners. at Graven Hill, a remarkably entrepreneurial local council has bought hundreds of acres of disused Ministry of Defence land, then created the plots, the street layouts, the schools, nurseries, cycleways and even a pub. The buyer picks a “golden brick” plot – they range from space for a two-bed “pocket” home through to six-bed detacheds – then designs their home and gets it fast-tracked through the planning system. There are architects available or you can use your own. You can have an ‘off the shelf’ design or have something a bit different. For example, see the service provided by Facit-Homes. It is the ultimate Grand Design dream and indeed Kevin McCloud is on site filming for s six-part series due to air later this year. You can also make sure that the property is well built and that everything works properly. 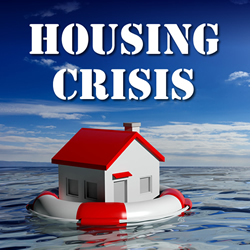 How many people have bought new houses only to find that there are major problems? For example, this poor man found 140 problems with his £580,000 new house and there is a Home Owners Alliance website section specifically to help new home-owners deal with problems. So how much does it cost? Well it depends on the size of your plot obviously and the design you eventually come up with but a ballpark figure is probably in the region of £300,000 (see the Guardian article for more detail) – although finance is available. And you end up with the house that you want. So although this is not exactly a solution for housing the homeless it is a way of improving our national housing stock – the Graven Hill site for example has stricter eco standards that normal building sites. Meaning that the house will be cheaper to run once you are living in it. And if you decide to build it yourself you will probably save around 15%. If this is what you want, then probably the best thing to do is take a look at the current custom sites available and see which one would suit you. You can find a list in the Custom Build Homes website which has a huge amount of information about custom built and how it works incouding a lot about how to finance it. A quick search on the internet also brought up Potton who say that they have custom build plots across the UK. Or, if there is an area being developed near you, ask if there are any custom build plots available. The more people who request custom build and clamour for Local Authorities to provide it, the more custom build plots will be made available. So if you want to do this and there is no custom build site near you – contract your Local Councillor and ask why not? You may be instrumental in making it happen. I disagree with this statement, all they have shown is that a few people want something that the mass market builders are not providing. It tells us nothing about what most people want. Well obviously we can’t peer inside the heads of the entire population, nobody can, but it is a good indication. "You only get the Justice that you fight for ..."
Do YOU have a housing crisis of your own?